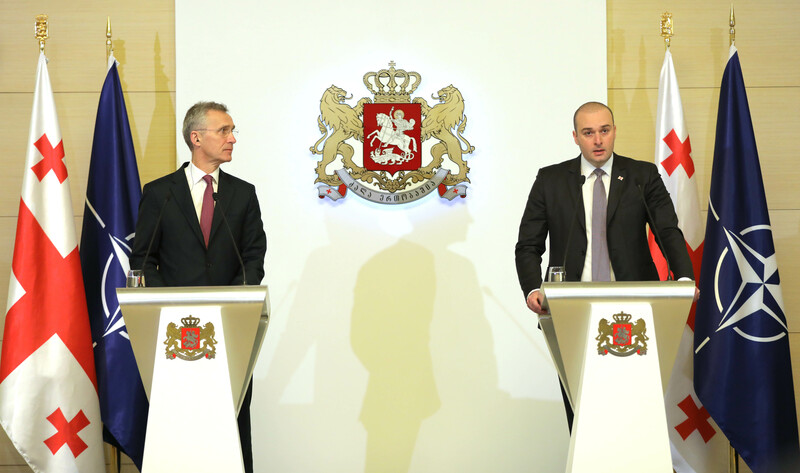 It is a great honor to be hosting NATO Secretary General Jens Stoltenberg in Georgia. Firstly, I would like to emphasize that Georgia-NATO relations are at an all-time high. Mister Secretary General's visit to Georgia is clearly reaffirms that NATO supports Georgia's accession to the Alliance, and stands by our country in this process. We deeply appreciate the fact that, during his visit, the Secretary General will attend NATO-Georgia exercise seeking further to enhance our country's resilience and interoperability with NATO. I avail myself of this opportunity to thank the participant countries and wish them successful and productive exercises. NATO membership is the key priority of Georgia's foreign and security policy. The vast majority of Georgian society supports Georgia's aspirations of becoming a full member of NATO, which reiterates that our choice is not a political choice only. Georgia's accession to NATO is a value-based choice. As you know, we have included a provision about this priority in the new version of our Constitution, and that reaffirms that the choice of the Georgian people is irreversible and resolute. During the meeting, we discussed Georgia's progress toward NATO membership. Of course, Euro-Atlantic integration involves numerous far-reaching fundamental reforms. As it was pointed out, the successful fulfilment of Georgia's obligations and the effective use of integration mechanisms help Georgia reach the ultimate goal of accession to NATO. NATO reiterates its commitment to the decision about Georgia's eventual membership. Once again, I would like to thank the Secretary General for his invaluable support of Georgia. NATO always emphasizes its support for Georgia's territorial integrity and sovereignty. We also discussed the issues and challenges related to the occupation of two of our historic regions by the Russian Federation, the painful challenges we are facing in every direction in these territories, including due to fundamental human rights violations. At the same time, we discussed the peace initiatives developed by the Government of Georgia. We welcome the fact that the meeting emphasized Georgia's significant contribution to stronger Euro-Atlantic security, and singled out the commitment and professionalism of our hero troops. The meeting also underscored Black Sea security-the message that we have long been bringing up and discussing with our friends states that sustainable security in the NATO space is impossible without Black Sea security, and we are happy to see that the Black Sea is being given increasing priority by NATO. We also discussed the decisions of the Brussels Summit on deeper Black Sea cooperation with Georgia, and we defined prospects of future cooperation. Once again, I would like to thank the Secretary General for visiting Georgia and supporting our country. Mister Stoltenberg is a loyal friend to Georgia, and I would like to thank him personally for being Georgia's loyal friend. Prime Minister Bakhtadze, it is great to be back in Tbilisi, Georgia and to meet you again. I have visited Georgia several times as Secretary General of NATO, and it is always a pleasure to come back. This time, I am going to visit the NATO-Georgia exercise, and the fact that this exercise is taking place shows that we are stepping up our cooperation within our partnership. And this is the second time that Georgia holds this important event, demonstrating the ability of the Georgian armed forces to operate side-by-side with Allies and other partners. This exercise is hosted by the NATO-Georgia Joint Training Center, which has been working to strengthen our countries' defense, or your country's defense, since it was inaugurated back in 2015. And I was actually there when we inaugurated the center, and it is great to see that the center is now delivering, playing a key role, as we hoped it would be when we inaugurated it back in 2015. Georgia is a unique partner for NATO. Last summer in Brussels, all NATO leaders reconfirmed the Bucharest decision from 2018 that Georgia will become a member of NATO. You are the largest non-NATO contributor to our Resolute Support Mission in Afghanistan, and Georgia also contributes to our NATO Response Force. And the NATO-Georgia exercise this week demonstrates that we are stepping up our cooperation. Georgia has made a lot of progress in important reforms, including strengthening Parliament's role in overseeing the security sector, and the reform of Georgia's judiciary. I was glad to hear that these efforts will continue. Your efforts to modernize the armed forces, and to build more effective defense institutions, have also been very impressive. I also welcome your commitment to spending 2% of your GDP on defense, and I congratulate Georgia for spending 20% of the defense budget on equipment and modernization. This strengthens your military and your contribution to regional security. I welcome your efforts in all these areas, and I encourage you to continue making full use of all the opportunities for coming closer to NATO, and to prepare for membership. NATO fully supports Georgia's territorial integrity within its internationally recognized borders. We call on Russia to end its recognition of the regions of Abkhazia and South Ossetia and to withdraw its forces. We also share your concerns about Russia's military buildup in the Black Sea Region. That is why we are strengthening the cooperation between Georgia and NATO, also with cooperation regarding our naval forces. We are providing training for Georgian coastguard boarding teams. During our meeting today, we discussed what more we can do strengthen our cooperation when it comes to naval forces. And also, the NATO Maritime Command is cooperating with Georgia's Joint Maritime Operation Center. So, Prime Minister, let me thank you for your hospitality. We will continue working together to prepare Georgia for NATO membership. Georgia is a reliable contributor to our shared security. I look forward to continuing working with you as Georgia moves closer to NATO. So, once again, thank you so much! Q (Public Broadcaster): My question involves NATO integration and Russia's role in this process. We are aware of Russia's position that it will never accept Georgia's NATO membership. Georgia, as it was noted here and at other high-level meetings, is successfully fulfilling its obligations. We hear from international partners that it is time for Georgia's progress to be better appreciated. Still, when this issue comes up, Russia's factor emerges. What is the solution? For NATO, it is an absolutely fundamental principle that every nation has the right to choose its own path. Georgia is a sovereign nation, and Georgia has the right to choose its own path, including what kind of security arrangements you would like to be part of. And this is not only something clearly stated by NATO. It is actually a fundamental principle which was agreed by all nations in Europe, even Russia has signed the Helsinki Final Act, and many other documents, which clearly state every nation has the right to choose its own path, including whether or not it would like to become a member of a military alliance. So reality is that for Georgia to decide what Georgia wants, and then it is for 29 allies to decide when we are ready to accept you as a member. No one else has a say in that process, because it is not about accepting what big powers have arrived to decide what their neighbors can or cannot do. For me, coming from a small mountainous country bordering Russia in the north, Norway, for us it is extremely important that we are not accepting that Russia, or any other power, can decide what neighbors can do. Norway joined NATO in 1949. At that time, Joseph Stalin did not like that Norway joined NATO. But the NATO allies-the United States, Great Britain, France-they said no, it is not Joseph Stalin who will decide whether or not Norway can join NATO. It is Norway and NATO allies. And it is exactly the same principle today. So it is up to you and the 29 allies to decide. And the 29 allies have clearly stated that Georgia will become a member of NATO. That is no provocation against anyone. It is a sovereign right of any sovereign nation to decide. Then you have to implement reforms, and that is exactly what we discussed today. That is exactly what we are working on every day together: modernizing your defense institutions and judiciary, meeting NATO standards, and you have made a lot of progress. We are impressed by that, and we recognize that progress, and we encourage you to do even more. We work with you. It is good for Georgia and NATO because interoperability-the fact that we are working together in Afghanistan, the NATO response Force, and the exercise here today-all of that is good for NATO and for Georgia. We continue to do that, and at the end, it is NATO allies and Georgia, and no one else, deciding when Georgia is becoming a member. Thank you for your question. Today we once again heard strong messages from the NATO Secretary General about NATO continuing its open door policy. The main message is what we just heard from Mister Stoltenberg, namely that no one is allowed to restrict an independent, sovereign state in its choice. The Georgian nation's choice is full NATO integration. Consequently, this issue is subject to negotiations between Georgia and the NATO member states, and no one has a right to attempt to interfere or created obstacles. We are effectively continuing on this path. We understand, of course, that a decision cannot be made overnight. Still, we have once again heard strong messages about Georgia's eventual membership. NATO continues the open door policy. I would like to remind the public about the decision on North Macedonia. At the same time, we have a package of reforms to implement in order to draw closer to NATO standards and to enhance our interoperability with NATO. I am convinced that, one day, Georgia's resolute decision will become a reality. Q (Rustavi 2): Mister Secretary General, Black Sea region stability and security is prioritized by NATO, including the Black Sea Security Strategy set as a goal in the recent years. Given the circumstances, how important is the Anakli Port project to be developed in Georgia? Mister Prime Minister, what is the state's position on the construction of this port? Another question, Mister Secretary General, is about the presidential election. NATO membership requires meeting democratic standards. The recent findings by OSCE and the State Department were quite harsh. Phrases like "vote rigging" appeared for the first time. In this context, will all this stand in Georgia's way to NATO membership? First, the Black Sea is of great importance to NATO and Georgia. We have to realize that we have seen significant Russian buildup in the Black Sea Region, especially after the illegal annexation of Crimea, and we also have seen the aggressive action of Russia against Ukrainian ships near the Kerch Strait. NATO has increased its presence in the Black Sea, and we are working with Georgia to address these security challenges in the Black Sea Region. NATO has more ship, more presence, and air policing, and more presence on the ground, in Romania, for instance, but also by working together with partners like Georgia in the Black Sea Region. We have two NATO ships in the Black Sea, one from the UK and one from France, and just a few days ago, several NATO ships participated in Poseidon, a NATO countermining exercise. And we have three states: Turkey, Romania, and Bulgaria, which also have presence in the Black Sea. All in all, this increased NATO presence in the Black Sea, and we work with Georgia to address the challenges we see, and we also welcome the fact that we have stepped up our cooperation, for instance, with Georgia's coastguard. We are training their boarding teams. And now we are looking into what more we can do to work with Georgia on naval capabilities. When it comes to reports about the elections, I just took note of what OSCE has stated. I think it just highlights the importance of continuing to reform, to making sure that your democratic processes meet the highest standards. That is always important. It is good for Georgia, and it is good for your efforts to move closer to NATO membership and Euro-Atlantic integration. We would very much like to see even more progress on these reforms to strengthen your democratic institutions, especially the way you are conducting elections. Thank you for your question. The Black Sea is currently NATO's top priority, and we welcome that. We all know that Georgia has a completely unique and, I would say, irreplaceable role in the Black Sea security concept. Accordingly, we have planned joint steps together with NATO to ensure sustainable security in the Black Sea Region, which will become more visible in following years. As for the Anaklia Port, Georgia's geographic location is unique. It is essential to our economy to transform Georgia into the regional hub, including in the areas of transport and logistics, which encompasses every dimension. Georgia will surely have a deep sea port. We fully support the Anaklia Consortium to enable it to fulfil its investment obligations. We have taken active part in ensuring that our European and American partners attach great importance to the operation of a deep sea port in Georgia, and Georgia will have a deep sea port. I would like to answer the second part of your question. Georgia is a leader on the path of democratic transformation, and we will continue our democratic consolidation. We have received concrete recommendations, and that is a normal process. Our political team in Parliament is also working on improving laws in a number of directions, including the directions pointed out by the OSCE recommendations. Q: What attempts are being made by NATO and Georgia toward resolving the issue of Russia's occupation of Georgia's territory? And what progress is being made? First of all, NATO calls on Russia to end its recognition of South Ossetia and Abkhazia and to withdraw its forces from these regions, because these regions are part of Georgia within its internationally recognized borders. And we will never recognize these regions as anything else. They are part of Georgia, and we strongly support Georgia's territorial integrity and sovereignty, including Abkhazia and South Ossetia. The way to solve this is by conducting political talks. It is not easy, and we have not seen that much progress, but the framework to address this issue is the talks in Geneva. I will leave it to the Prime Minister to reflect on the progress and the status of those talks, but NATO supports those efforts to find a peaceful and negotiated solution to the issue of the regions of Abkhazia and South Ossetia, which are part of Georgia. Unfortunately, Russia continues to occupy 20% of Georgia's territory. We are facing a dire human rights situation in the occupied territories. We are committed to our peace policy, and we are committed to resolving this conflict through the engagement of the international community. We are trying, and we are doing our best, to start implementing the peace initiative developed by the Government of Georgia, to find ways to stop the humanitarian catastrophe in both regions. The population has decreased almost six times since the occupation. These statistics alone clearly demonstrate the dire situation in the occupied territories. Russia must fulfil its obligations assumed in 2008 by withdrawing its forces from Georgian territories. We are committed to peace policy, and we enjoy support from our friend countries, in that the peace initiative by the Georgian Government are the only rights answer to these painful challenges we have in the occupied territories. Q: Is there a viable and realistic solution for Georgia joining NATO before the situation in Abkhazia and South Ossetia is solved? NATO allies have clearly stated that Georgia will become a member of the Alliance. And we are supporting Georgia to meet our standards, to continue to reform, and to be ready to join. I am also certain that we will find a way to address and deal with the issue of South Ossetia and Abkhazia. I will not go into details about that now, but we will continue to provide support, and Georgia will become a member of the Alliance. Georgia will become a NATO member, and that is the message we received at the last year's NATO Summit. I would like to thank all NATO member states for this important message. Naturally, that Russia continues occupying our territories should not be an obstacle on Georgia's successful path of NATO integration. It violates international order and undermines any type of security arrangement in our region. It is not only Georgia's challenge and great pain. It is a challenge facing everyone, including all EU and NATO member states. Therefore, we are trying to mobilize the efforts of our friend countries and launch an actual peace process, and to start implementing peace initiatives in the occupied territories. We are committed to peace policy and to the notion that, through consolidating the efforts of our friend countries, we will overcome this difficult challenge. I would like to reiterate that, at this point, it is of crucial importance to stop the humanitarian disaster in the occupied territories, such as human rights violations and violations against the right to life, to provide our citizens in the occupied territories with access to quality healthcare and education. We are fully focused on the peace process.